The Chicago Coalition of Welcoming Churches (CCWC) denounces in the strongest possible terms the violence and loss of life perpetrated Saturday morning October 27, 2018 at the Tree of Life synagogue in Pittsburgh. All forms of antisemitism are an affront to humanity and must be rejected. As a collaboration of more than 80 churches and other ministries which welcome and affirm people of all sexual orientations and gender identities, we proclaim all houses of worships must be free from violence and be places of peaceful gathering open to all. We morn with all the Children of Abraham, with all faith traditions, and with those with no religious affiliation the lives lost. We also stand particularly with Jewish members of the LGBTQ community as they grieve. The Parade Is Over. What Now? The Pride Parade is over. The streets have been cleaned. Halsted and Broadway are back to normal. (or at least back to what we've come to accept as normal there.) What do we do now? Stay tuned to this website. We have some suggestions on how to extend Pride beyond June. 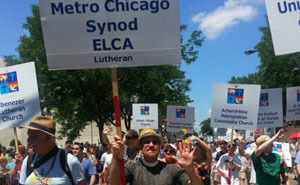 Hundreds of Coalition members joined together to march in Chicago's Pride Parade on June 24th. We made a loud, happy, BIG public witness of our congregations' welcome to all people. 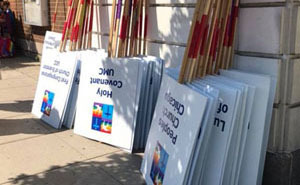 See many of the photos our members and the secular press took at the parade on the Coalition's Facebook site. The Chicago Coalition of Welcoming Churches was excited to gather for our Annual Pre-Parade Worship. It's the way we get ready to march in Chicago's Pride Parade! The worship was sponsored by the Chicago Coalition of Welcoming Churches with the Lighthouse Church of Chicago and Gilead Church. We met in Lighthouse Church's worship space, Uptown Underground, 4713, North Broadway, Chicago. Our brunch was an AWESOME and inspiring success. Special thanks the the welcoming people of Irving Park United Methodist Church for hosting us. You can see more photos from our brunch on the Coalition's Facebook site.